Every shark species has a collective personality. 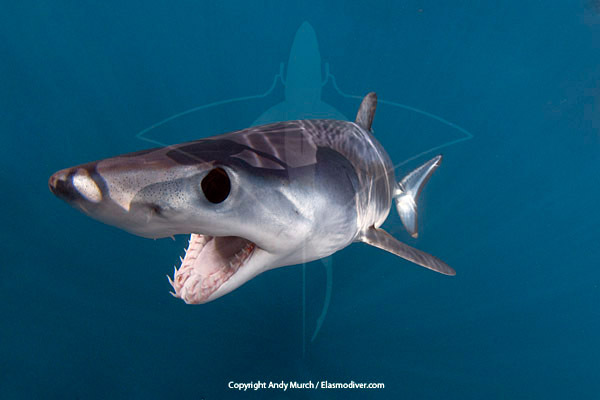 Shortfin mako sharks come in fast and mouth everything in sight. In their initial enthusiasm they often ignore the bait completely and bite the outboard engines instead. Unfortunately for photographers, their mouthing mode rarely lasts more than a few minutes. In the time that it takes to gear up and slip into the water, the action is usually over. 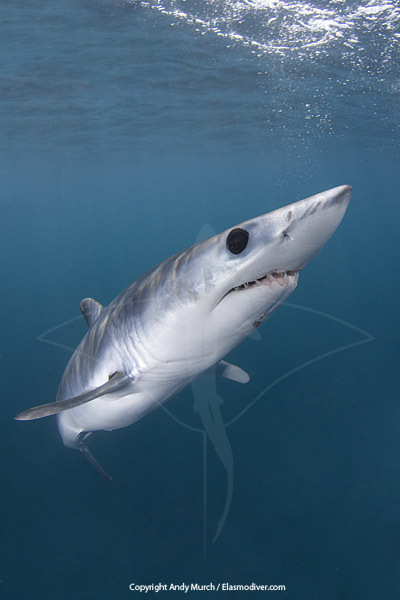 Once they calm down, mako sharks enter a more cerebral state. They swim around slowly at a distance, probably trying to understand where the delicious aroma is really coming from. At this stage, if you’re a photographer looking for the quintessential gape shot, you’re unlikely to succeed. I’ve been trying to nail that shot for years. On my last attempt I finally encountered the type of fearless mako shark that photographers dream about. I was in San Diego working with mako expert Walter Heim. Walter was once an avid recreational shark fisherman but when he noticed a significant decline in blue and mako shark numbers, he traded his rods for a tagging pole and an underwater camera. Now an accomplished photographer, Walter spends most of his summer weekends drifting off the coast of Southern California in a small aluminum boat. I met Walter and two other divers on a cool September morning in Mission Bay. We motored westward at a good clip until we were ten miles out from La Jolla Shores. The sun was hidden behind a grey blanket of clouds and the sea looked cold and uninviting. Walter suspended a small bucket of frozen fish scraps from the starboard rail and deployed a sea anchor to stop the wind from dragging us away. Then we sat in silence and waited. While fish scales drifted away in the departing chum slick like a trail of tiny bread crumbs, Walter talked about his ‘hand camming’ technique. Rather than plunging in like the rest of us, Walter holds his camera over the transom and shoots blindly in the direction of the shark. There are some obvious compositional drawbacks with this method but it’s a good way to rattle off a few shots while the sharks are still interested. It was a while before any sharks caught our scent but eventually Walter spotted a slate grey fin snaking towards the boat. Mayhem ensued while I ignored Walter’s advice and clumsily jumped into the water with snorkel and fins more or less in place. True to form, by the time I got my bearings the two meter mako which had left some respectable gouges in the ship’s propeller, was swimming away at a casual pace. I bobbed around for a minute or two willing it to return, and to my surprise it slipped back into view and swam towards me. Walter tossed a small mackerel in its general direction and the little mako changed gear and engulfed the sprat before I had a chance to react. Makos move like bullets when they are chasing a meal. They have been compared to race horses, cheetahs, eagles, Ferraris, fighter jets and just about every other fast moving entity. But, when it comes to speed, the power that makos display has no terrestrial comparison. Consider this; cheetahs (the fastest animals on land) are capable of sprinting at about 120kph. When in a power dive, the peregrine falcon can hit 300kph with a little help from gravity. That is pretty impressive until you consider that peregrine falcons are only flying through air. 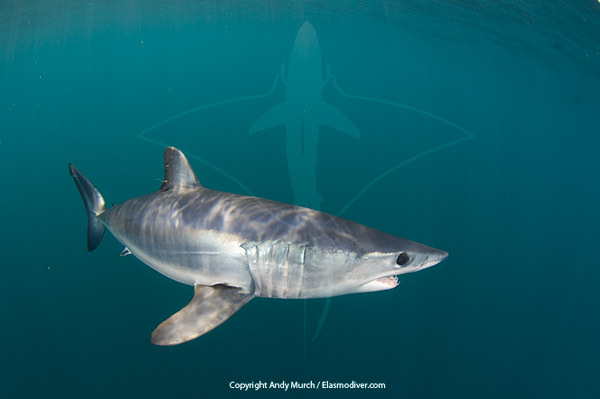 Shortfin makos have been recorded at 56kph, which is undeniably slower, but water is almost 800 times denser than air at sea level. Resistance-wise, that’s like flying at 44,000kph! They can do this because of their chiseled hydrodynamic profile and their extremely efficient red muscle mass. 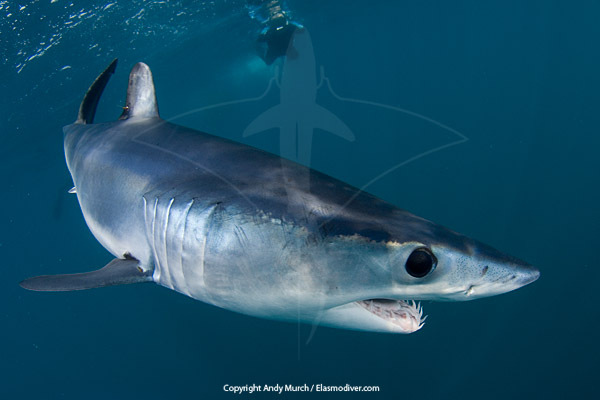 Like other mackerel sharks and some game fish, makos have a specialized vascular network called a rete mirabile (wonderful net in Latin) which acts as a counter-current heat exchanger. By sending pre-warmed, oxygen rich blood to their muscles, more energy can be converted into raw power. It was a classic threat display. 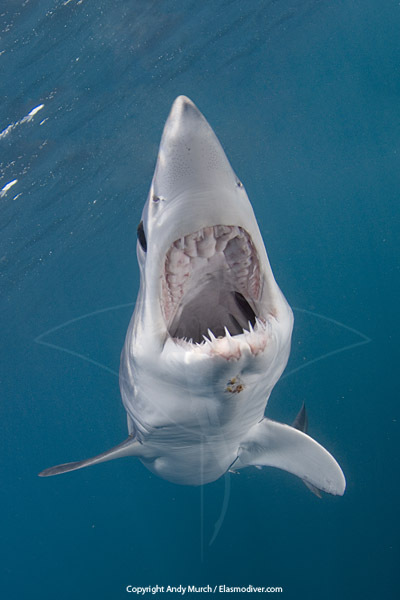 The mako was trying to intimidate its perceived rival by flashing its impressive dentition. A larger shark may have taken it to the next level (more fool me for getting in its way) and a smaller shark would probably have turned tail and fled. But in this shark’s brain I was its physical equal so the fish were fair game for whoever got to them first. Walter tossed a third fish and I closed the gap as quickly as I could. The mako streaked in, took the mackerel and then shot towards me mouth agape. I started firing away. As I did so, my whining strobes had a bizarre effect. The mako stalled right in front of me and started quivering its jaws. Either this was an extension of its previous threat display or the shark’s keen senses were overwhelmed by the powerful electrical discharges. Never once did he actually bite down on my camera. As long as my strobes continued to fire the mako remained in front of my dome port, swimming slowly forward as I back peddled at the same pace. As soon as I stopped shooting he turned and disappeared. We repeated this dance a couple more times. The other divers slipped in beside me and I did my best to compose a few shots rather than just using my camera as a shield. 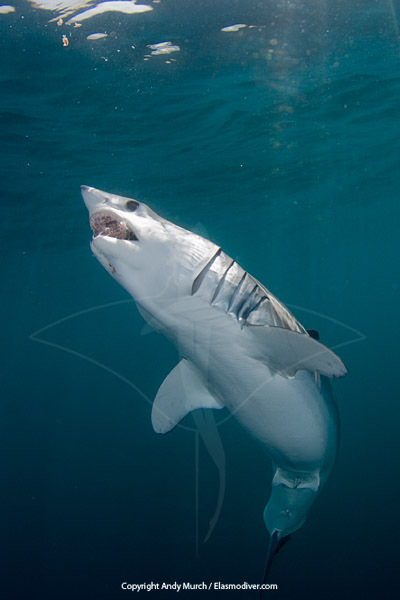 The shark’s close proximity made framing each image a bit challenging even with a fisheye lens. I could fib about the photographic finesse I showed that day but in reality it was a very haphazard affair that happened to yield some spectacular results. Later, Walter who has encountered hundreds of makos in the wild, confirmed my suspicion that this was a very special shark. Rarely is a diver afforded such a sustained display of bravado. After decades of over-fishing, encounters with makos and blues in Southern California are no longer guaranteed. 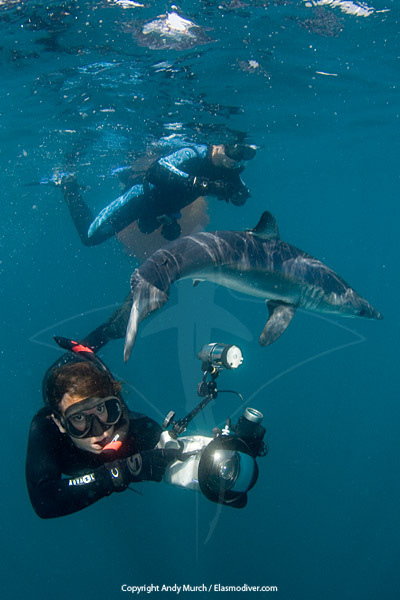 A few years ago the last commercial shark dive operator hung up his fins for good, but there are still a few sharks out there for divers with their own boats and a little ingenuity. Go while you still can. Even though many recreational fishermen now practice catch and release, makos grow rarer every year. One reason is the demand for mako steaks especially in Italy which is the biggest importer of mako meat in the world. After decimating its domestic population, Italy now imports much of its meat from France, Spain, Northern Europe and South America. Makos are also relentlessly fished by Asian long-liners. Mako fins are highly prized because of the length and quality of the noodles that their fibers produce. 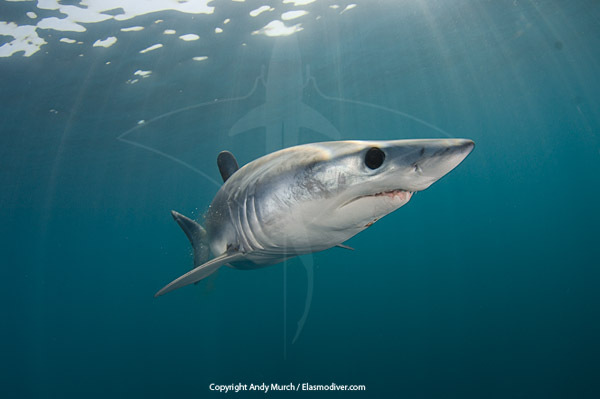 Regional fishing bans are generally ineffective because of the mako’s migratory nature. Once they enter international waters they are fair game for any fishing boats that are waiting for them. Fortunately, there is now a powerful lobbying group called the Shark Alliance that is pushing for stricter protection at a global level. 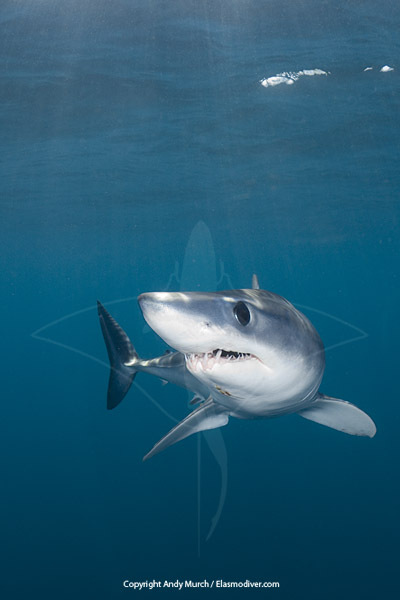 If you want to do your part, consider joining a local conservation group such as The Shark Safe Network which promotes catch and release and encourages marinas to ban the landing of sharks completely.